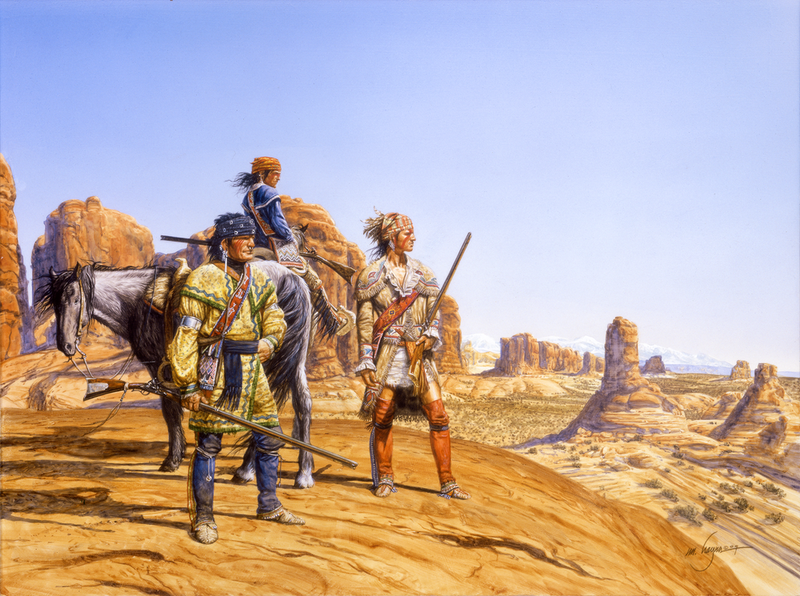 "The Scalp Hunters" depicts some of the Delaware who roamed the west as fur trappers, hunters and scouts. Some, like this small band, also hunted Apache scalps for bounty. Unlike other displaced tribes who were pushed west, they never adopted the trappings of their plains tribes neighbors but kept their material culture relatively intact. This made for an interesting visual dichotomy of the eastern woodland look set against the red rocks of the desert southwest. They were also sworn enemies of all the western tribes through whose land they roamed. Tecumseh was a famous Native American leader of the Shawnee. He spent much of his life attempting to rally various Native American tribes in a mutual defense of their lands, which eventually led to his death while fighting with the British in the War of 1812. 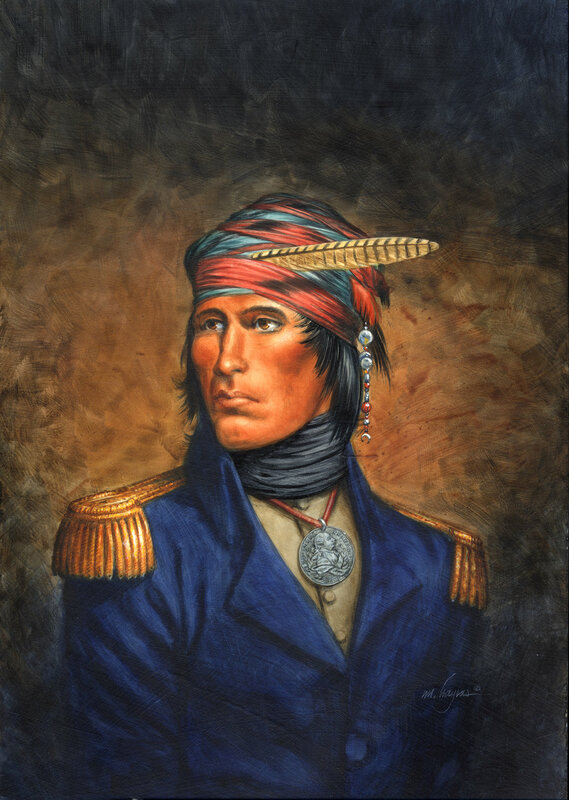 In this portrait Tecumseh is wearing a turban of a typical Shawnee style and pattern. The pendant suspended from the turban consists of trade silver and Venetian glass beads, also consistent with the Shawnee tribe. The medal hung on his chest is the 2nd issue King George III or Simcoe Issue Peace Medal, which was struck in 1794. This would have been a common peace medal issued by the British during this period. His epaulettes are typical British line infantry officer’s epaulettes from the mid-Napoleonic era and he’s wearing them on the shoulders of a civilian frock coat. 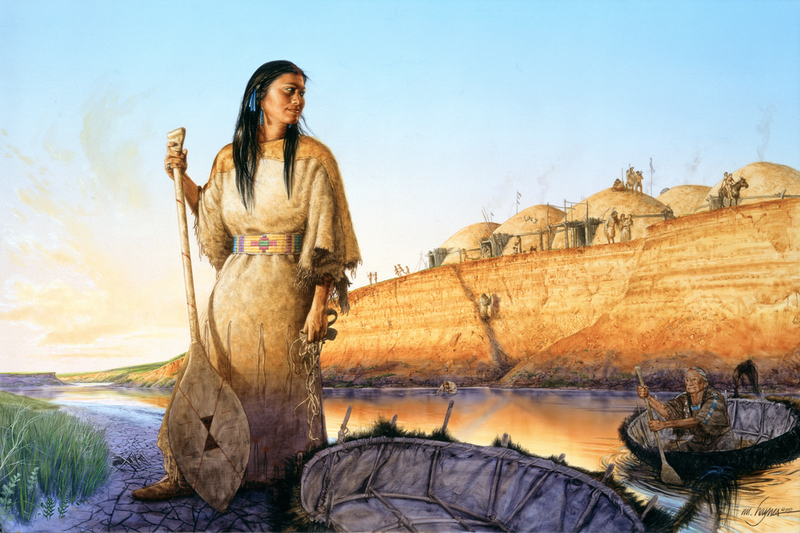 As a young Hidatsa woman has pulled her bullboat onto the east bank of the Knife river, the first light of day bathes the earthlodges of her Hidatsa village in what is now central North Dakota. It is still Mapi'-o'ce-mi'di, or Sunflower-Planting-Moon and the days activities begin early for there is much to do. It hasn't been too long since the People moved back into their spacious earthlodges on the terraces after spending the winter in their smaller lodges in the shelter of the river bottoms. The days are growing warmer and the first brilliant greens of spring are covering the prairie. It is time for the women to collect stakes for use in their gardens as well as firewood for the lodges. The sunflowers will be the first seeds to be sown in the women's gardens and the last to be harvested in the autumn. In addition to their value as food, the brilliant flowers will add beauty and the tall stalks will be a defining boundary for each family's plot. The young woman waits as her elder follows in another bullboat. These boats were made of bull buffalo hides stretched over a framework of willow. The tail has been left on and reinforced to mark the stern as well as a place to tie on trailing boats. A surprisingly large amount of cargo could be floated in this fashion. An accomplished paddler was required as the boat would simply spin in circles in the hands of a novice. As early spring is a harbinger of change, so too was the scene depicted here. Within a few short decades the Hidatsa's traditional way of life, well ordered, deep in spiritual and familial traditions was to be disrupted irreparably. 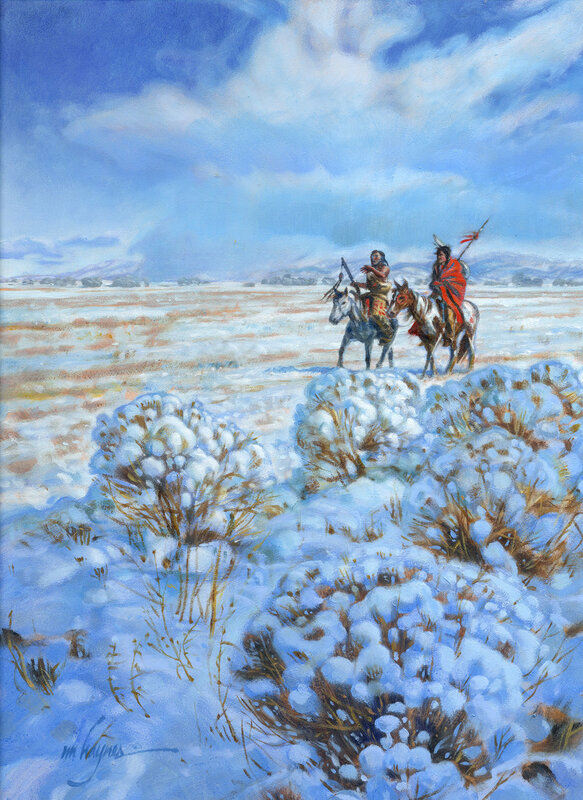 This painting is of an 1850's era Cheyenne warrior out solo on a horse raid who has unexpectedly come across a broken and discarded Wedgewood china plate. It was common for settlers to jettison items that broke or became useless en route across the Great Plains. I liked the juxtaposition of the very sophisticated china plate abandoned on the vast and wild plains and its discovery by this warrior. The pattern on this Wedgewood plate, a British pastoral scene actually dates to the 1820's and all the details of arms, dress, paint and accouterments on our warrior are documented to the 1850's. His wolf headdress was expected to empower him with stealth while the hoof prints painted on his horse count the number of horses he’d stolen on previous raids. The lightening bolt pattern on his mounts hindquarters is for speed. His musketoon is originally French, which he’s decorated with brass tacks. 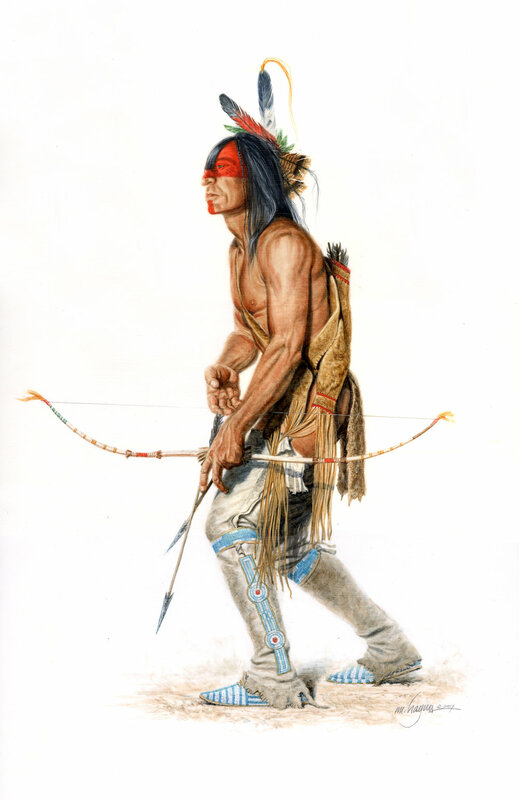 The quill and beadwork on his moccasins and quivers are of an early Cheyenne pattern.